If you’re a Role-playing game fan and an iDevice gamer, you’ve likely heard of Ravensword, Aralon or Rimelands. In their own unique way, each of these games offer one heck of an expansive setting and adventure delivered to us by Crescent Moon Games. They’ve mastered the ability to bring forth Role-playing games with the caliber of such epic gaming experiences that in many cases (in my opinion) triumphs the PC/Console series, Morrowind. Insert Pocket RPG, Crescent Moon Games’ latest RPG title and a game not of epic or grand scale proportion, but of epic fun and endless baddies to dispatch of. Pocket RPG sets out to take the standard issue role-playing formula and tone it down to more or less a dual stick shooter with a splattering of RPG elements throughout its gameplay. Designed from the ground up to be a pick up and jump right in sort of game, Pocket RPG simply presents you at the very start with three core character classes to choose from. Each of these classes (warrior, ranger, or magician) offer a vastly different and unique play style of their own. Pick your class, no need to name him or her, and you’re sent off into a world that changes every single time you play the game. What do I mean by that? 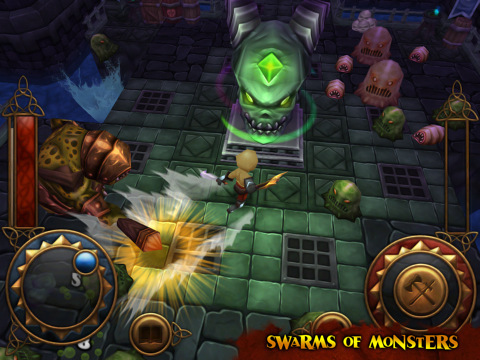 Well, each time to enter the game, the dungeon, in which your hero is set forth to destroy baddies from, is uniquely randomly generated each and every gameplay session. This creates a game that’s never the same from dungeon run to dungeon run. Speaking of dungeons, this is the core element of Pocket RPG’s gameplay, or as the genre is referred to, “Dungeon Crawling.” As you progress across an over-world map, the randomly generated dungeons that you’ll enter offer up different locations and a set of unique environments of their own. Some being snow covered, some dark and wet catacombs and even some Egyptian-type sand dungeons. 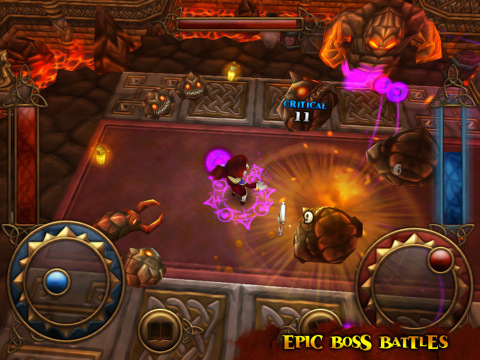 As progression occurs, your character is automatically leveled-up during each dungeon run. Throughout the game you’ll come across new weapons, coins and items to equip your character. However, at the start of every new dungeon, you’ll be starting over at level 1! It may sound a bit intimidating, but trust me, it certainly adds a nice gameplay element of being able to start with a fresh set of new weapons at each and every new dungeon, it is loads of fun! Plus, at the end of every dungeon, you’ll be offered the ability to purchase new and unique abilities, specific to your character class, along with the ability to unlock new and more powerful weapons that will be scattered throughout each level. Pocket RPG’s graphics, despite the fairly simple nature of the gameplay, are certainly no slouch! As of now, the game is only available on iPad (iPhone version coming in August according to CM Games!) and is rendered in some of the absolutely most crisp 3D graphics I’ve yet to see. The graphical style, while unrealistic, is a cross between anime and “World of Warcraft,” which offers a less lifelike, but very pretty to look at approach. Enemies vary from one to another and the environments are gorgeous to behold as you plow your way through levels with either dual-wielding swords, a flurry of arrows or an arsenal of deadly magic. Is the game without any faults? Not at all. I’ve run into a few crash bugs that have sent me to start over on a dungeon, but as promised I’m certain that CM Games is hard at work squashing these bugs for future updates of the game. My only other complaint? Multiplayer, or more specifically, the lack thereof! Once you finish that first dungeon you’ll say to yourself “Wow, this would be totally awesome to play in co-op mode with a friend!” and it’s soooo the truth. No word on whether or not we’ll see multiplayer in the future, but I’m certainly keeping my fingers crossed on it. 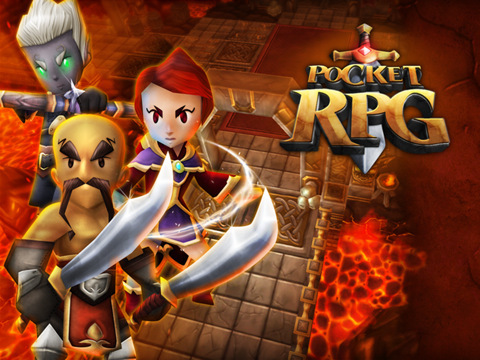 Despite a few negatives, Pocket RPG offers a vast variety of gameplay (never the same dungeon twice) and multiple character classes to experiment with and enjoy. Crescent Moon Games has done it again, Pocket RPG features outstanding gameplay, top notch polish (aside from the aforementioned crash bugs) and is a total riot to play. I fully recommend this game to anyone looking to for an exciting and fun to play dungeon crawler.